It always seems to be all of nothing when it comes to the weather in the UK. For months it is wet, grey, cold, raining and miserable, and then all of a sudden there is a heat wave. There seldom seems to be a “Goldilocks moment” with the weather where it is neither too hot nor too cold, but is just right! We Brits are renowned for moaning about the weather and for complaining about it being too hot, but when it comes to the elderly in particular, heat can be serious. Elderly people are particularly prone to heat stroke and heat exhaustion. This can be for a number of reasons. As we get older, our ability to notice changes to our body temperature disappear, along with our body’s ability to adapt to changes in temperature. Also, many medicines that elderly people take can increase their risk of dehydration, and many of the health problems experienced by elderly people can make it hard for them to adapt to the change of temperature. There is also the issue that many elderly people live alone, and so there is often no one there to help them to look after themselves, to keep them cool, or to spot if they are over heating. Here are a few tips as to what elderly people can do to stay cool during the summer. Drink more fluids such as water or fruit juice to help avoid dehydration. It doesn’t matter if you’re thirsty or not – you need to keep drinking plenty. Drink less coffee, tea and alcohol. Alcoholic drinks and caffeinated drinks can actually make you more dehydrated. Keep an eye on the colour of your urine. If it is brown of dark yellow it is a sign of dehydration and means you need to drink more. Review your medication with your doctor to see if it might increase your risk of heat stroke. It may be that they advise reducing the dosage or changing the medication entirely during the hot weather. Wear light, loose fitting, light coloured clothes to help keep you cool. Don’t overdress. Make sure you wear a wide-brimmed hat to keep the sun off of your head. Don’t go out in the mid-day sun! As the song goes, only mad dogs and Englishmen do this. During a heatwave try to avoid going out between 11am and 3pm as it can be really hot then. Try to avoid crowded places, especially at times when they are likely to be busy. Don’t overdo it – shopping, gardening, hoovering, dusting, etc. can all wait. Just take it easy and avoid exercise and strenuous activity, particularly outside. Lying down when it is hot isn’t being lazy – it is being sensible! If you have electric fans, use them. If you don’t own any electric fans, see if you can buy some from a nearby shop, order some online or ask a friend or relative to pick some up for you. Draw your blinds and curtains – this will help to keep the house cool. Open windows at night to help cool down the house, and if possible open windows on opposite sides of the building to create cross-ventilation. Take a cool (not cold) bath or shower to help cool you down. If you’re lucky enough to have air conditioning, use it. If not, and there is somewhere nearby that you regularly frequent that does have air conditioning, such as a library, museum, cinema, restaurant or café, then consider spending more time there. Keep an eye on the weather forecast or listen to it on the radio. We know it isn’t always right, but the short term weather forecast is usually quite accurate, and will alert you that a heat wave is expected. Pay special attention if the temperature is forecast to be over 30 degrees celsius (86 degrees farenheit). Know the signs of heat related illness including heat stress and heat stroke. These can include pale skin, muscle cramps, dizziness, fainting, breathing problems, nausea, headache, a faster than normal heart beat, chest pains. If you experience any of these symptoms then you should seek help immediately. Heat related illness can be fatal, so do not be afraid to dial 999 in an emergency. If you have an elderly relative or friend who might be affected by the heat, then you can and should help by checking on them regularly to make sure they’re ok, knowing the signs and symptoms of heat related illness, finding out if their medication might be affected by heat, making sure their home is well ventilated and that they are following the tips above. If you are elderly and live alone, or have an elderly friend or relative, then our companion service can help during a heatwave. Senior Help provide professional, dedicated and reliable companions to care for you or an older family member. We offer the the very best, carefully checked companions who are chosen specifically to suit you and your non-medical needs. Our companions are all experienced, deeply committed and passionate about enabling everyone to maintain their independence and enjoy later life. 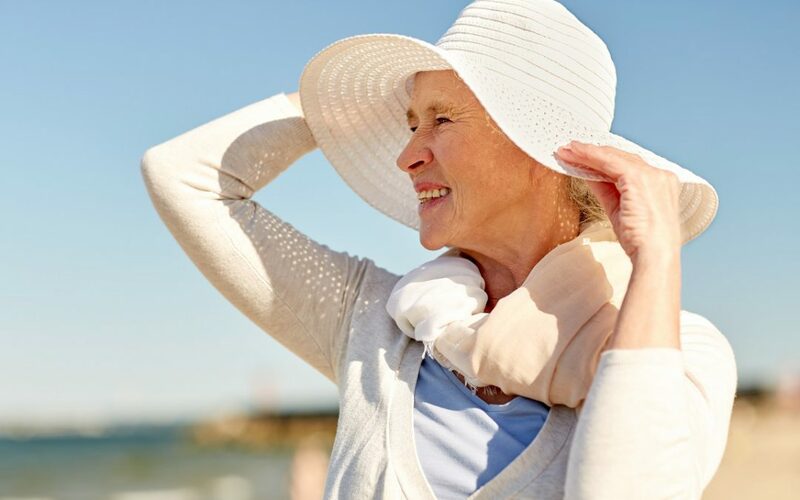 We can be present to make sure that you or a loved one are kept cool and safe, are drinking plenty and following all of the advice in the article above, and can help to get medical assistance if required. Our service can not only provide peace of mind to loved ones during the hot weather, but can also save lives.